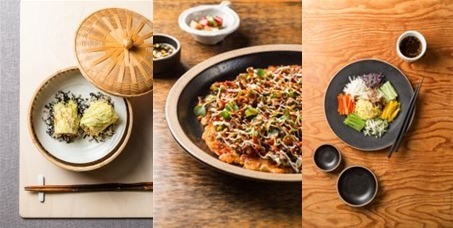 Three young Korean cuisine chefs were awarded Monday by the Ministry of Agriculture, Food and Rural Affairs, for their innovative dishes using local ingredients. An event the same day invited a panel of judges to taste and evaluate 10 up-and-coming Korean chefs’ new creations at the Korean Cuisine Cultural Center in Jung-gu, Seoul. 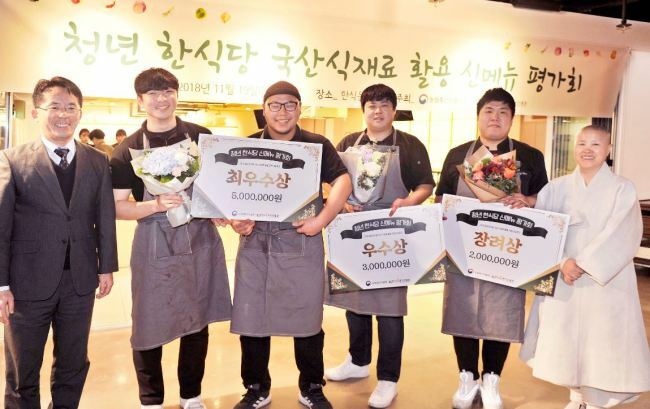 The contesting restaurants were selected at the start of this year and were given 12 million won ($10,600) funding from the Ministry of Agriculture and Food. Eligible restaurants were owned by chefs aged between 20 and 39 who have run restaurants serving “hansik,” or Korean food, for under three years, from March 2015. Since they were selected seven months ago, these chefs have worked on developing new hansik dishes using local ingredients and showcased the outcome of their efforts, Monday. The evaluation panel included 10 Korean cuisine experts and 10 “ordinary” foreigners recruited for the occasion. Top restaurant Zisus took home 5 million won in prize money for its cabbage pancake stuffed with samgyeopsal pork, and Hyungongbang and Leesikdang restaurants won 3 million won and 2 million won, respectively, for their kimchi pancake topped with beef bulgogi and cold noodles tossed with Korean beef brisket, respectively. The event was hosted by the Ministry of Agriculture, Food and Rural Affairs and supervised by the Korean Food Promotion Institute.